Benefits that go beyond Math! 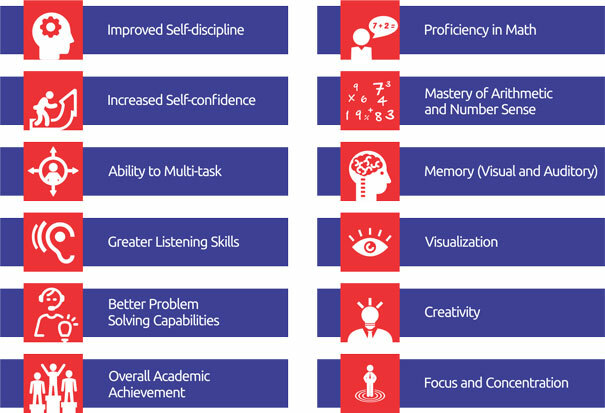 Our whole-brain development program builds foundational techniques that make learning math, effortless and enjoyable. By mastering these techniques using the Abacus, students develop the ability to think in pictures and quickly learn to perform large calculations mentally. Over time, our students come to love a subject they may have once struggled with, or even feared. Attaining astonishing calculation speed is actually the end-result of increasing the “brain-fitness”. Visual Arithmetic Visual Arithmetic is a building block for future success in all areas of study. Students learn to focus for sustained periods, to manage their time while completing long series of sums, as well as, to concentrate on more than one task at the same time while. These are crucial life skills that students will use again and again. UCMAS demands self-discipline and promotes the joy of lifelong learning and self-discovery. Our students become motivated learners – the best route to success in academics and beyond.